Double sided. Paper mounted on hardboard, approximately 75 x 50cm (29 x 20"). The 'basic' blank poster was designed and printed by W. H. Smith & Sons Ltd., Bridge House, London for the Royal Air Forces Association 'Battle of Britain Week' in the early 1950s. These were supplied to local RAFA branches for relevent details to be added in order to advertise upcoming events. Super period artwork showing a Hawker Hurricane fighter in flight. 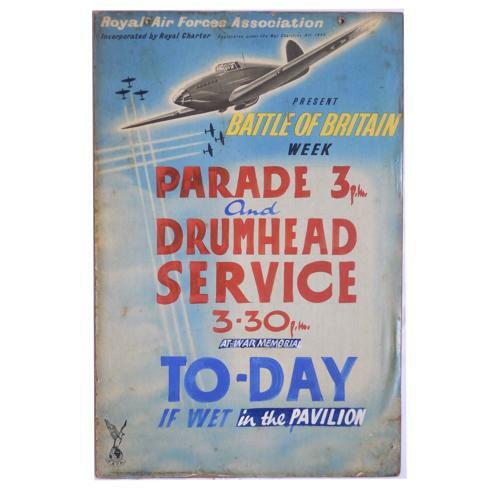 This poster was used in Torquay and one side is hand signwritten for a parade and 'Drumhead Service'. The reverse reads 'Help the R.A.F. Charities'. Condition is reasonable. Although the poster was varnished for protection at the time there is some paper loss, staining and wear. Nevertheless an impressive poster and would make an excellent backdrop display piece. This is the last of this type we have. Stock code P20214.